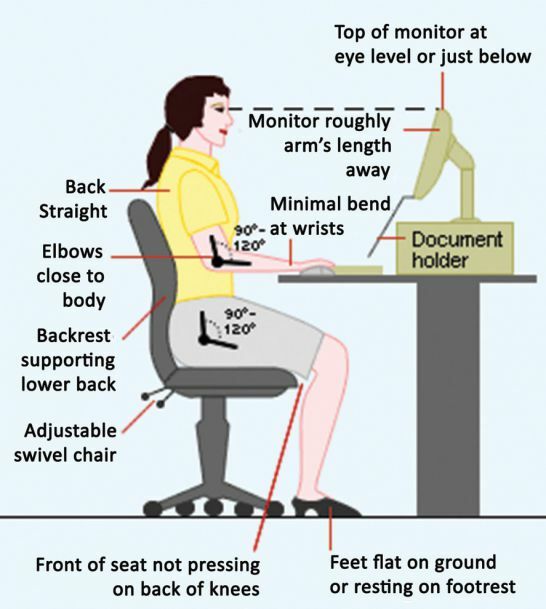 Ergonomic Tips: Posture Comes First! 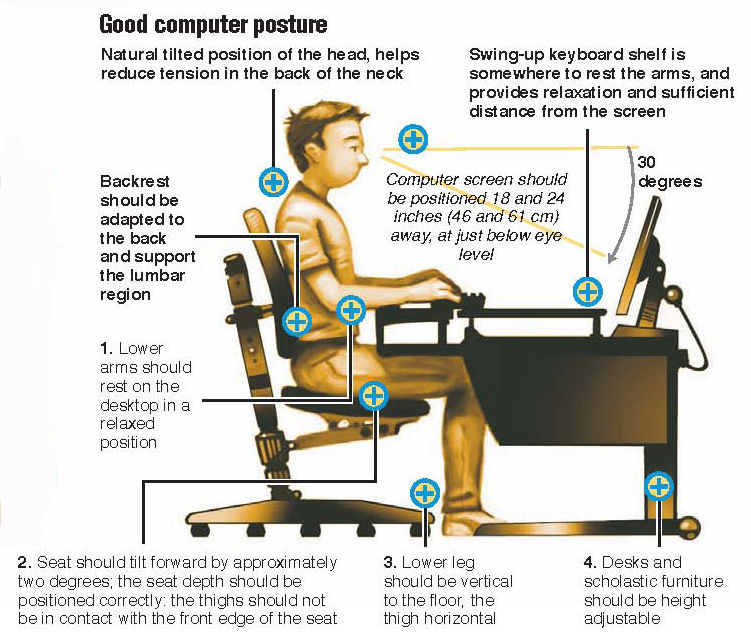 Is sitting with good posture REALLY that important? In a word, absolutely! Believe it or not, some find that sitting with good posture feels unnatural. This is because bad habits have been set in place for far too long. You have to recondition your office chair operating mindset from the ground up. It all starts with proper feet placement. When seated in your swivel chair you can't rely on the chair base as a foot rest. This perching technique restricts blood flow that leads to fatigue and cramping. While it may feel comfortable and natural because you're used to it, it's hurting you. As an alternative, commit to keeping your feet placed flat on the ground and facing forward. It's ergonomically correct. Next, you'll want to focus on the angle at which you're sitting. To make a long story short, if your back is not in contact with the chair when your working, you're missing out on the support your chair is ready, willing, and able to provide. The back of your chair needs to be as close to a 90 degree angle with the seat as possible to ensure proper spinal alignment. Too far back and you'll be over reach to type. To far forward and you'll be hunching and straining over the keyboard tray when working. As you move, make it a habit to reach for the tilt angle lever located underneath your office chair seat to adjust the chair back throughout the day. Taking a set it and forget it approach to office posture just won't cut it. You have to be ready to adapt at a moments notice. Your chair adjusts for a reason and the adjustment features themselves are meant to be used regularly. Take your chair arms for example. They likely raise, lower, slide, and swivel. This is to help you compute healthy while tasking at your workstation. 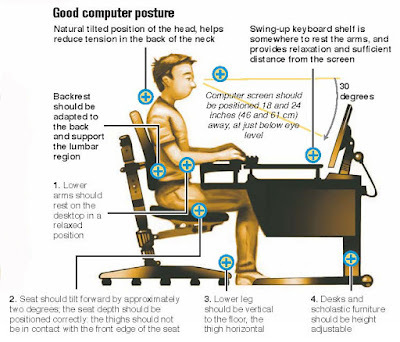 Many of your posture problems can be solved effectively with proper chair and workstation synchronization. While it sounds complicated, it's actually quite simple. First and foremost, you need to raise your computer screens up to eye level. A stack of books, a cardboard box, or an attachable ergonomic computer screen mount will do the trick. When your screens are too low, you're looking down at them when working naturally at your desk. Over the long haul, this causes significant strain on the neck and back. When you sit for extended periods of time, even good posture habits start to slip. That's why, taking short breaks is a must. Even a top of the line ergonomic chair with good back support should not be used for more than 1 hour at a time without standing up to stretch out those stiffening muscles. Make it a point to walk around the office to get the blood flowing. Grab a drink of water to stay hydrated, and if possible, step outside to get some fresh air. 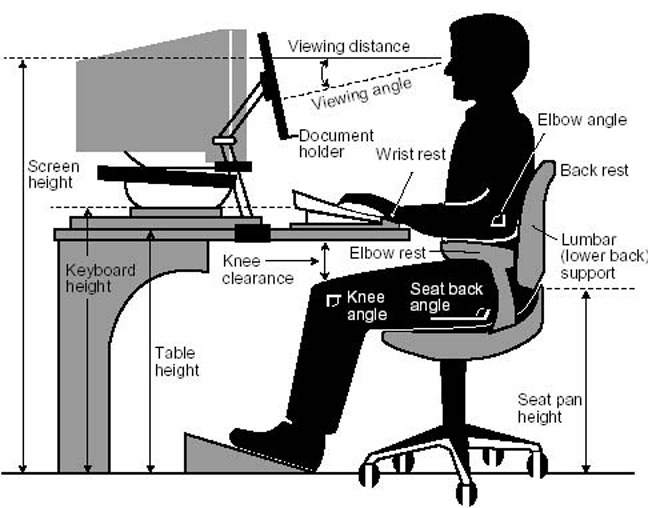 You'll return to your workstation ready to continue working ergonomically correct. Posture tips can be tough to remember, especially during busy work days. That's why tips charts and diagrams come highly recommended from physicians and ergo enthusiasts. 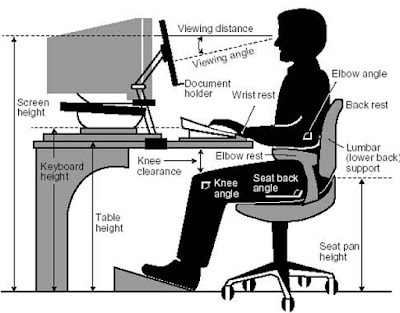 With a proper posture diagram posted within eye sight of your computer screen, you'll be keeping good habits fresh in your mind. Before you know it, you'll have exchanged your bad habits for good ones. Remember, even the best office chair is only as good as it's owner. You have to take the time to master it's features, strive for good posture, and take short breaks to stay refreshed.